Written specifically for 7th-grade Texas history classes, this book shows students how the state’s court system fits into the larger picture of Texas history: its roots, heroes, growing pains, and milestones, from the days of early Spanish colonization to the present. The book’s opening stories help students place themselves in an early Texas in which there was no law or order, and challenge them to think about how a society begins to organize itself. Subsequent stories show how laws were made and tested in the courts over the next 150 years, with an emphasis on the aspects of the Texas experience that are uniquely our own. The book is written by noted Texas historian James L. Haley and Austin writer-editor Marilyn P. Duncan. About the authors. The Taming Texas books are generously funded by the Fellows of the Texas Supreme Court Historical Society. Click here for a list of the TSCHS Fellows. Foreword, by Chief Justice Nathan L. Hecht, Supreme Court of Texas. The second book in the Taming Texas Series takes a closer look at how life on the frontier of Texas both shaped and was shaped by changing laws. Beginning with the claiming of El Paso by Spanish conquistador Don Juan Oñate in 1598 and ending with the closing of the Texas frontier in 1900, the book shows how the characters and events of Texas history were connected in important ways to the legal systems in place at each juncture. It also reveals what happened when the laws were not up to the task of protecting people, especially during the Civil War and Reconstruction. 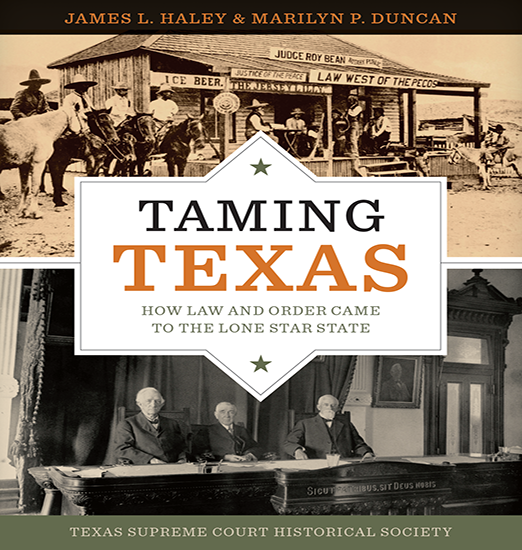 Like the first book, Law and the Texas Frontier was coauthored by James L. Haley and Marilyn P. Duncan. About the authors. Hardbound copies of Taming Texas are available for purchase for $20 plus $5 postage, handling, and tax. * that the first “lawyer” in Texas was an unnamed member of the Karankawa tribe who made a case for sparing the lives of Cabeza de Vaca and his men and won? * that Texas women owe some important legal rights to Queen Isabella of Spain? * that in the final years of frontier Texas, some notorious outlaws changed sides and became judges and lawmen? * that Texas is one of only two states with two “supreme” courts? These are just a few of the little-known facts about Texas history that fill this exciting book. The illustrations are awesome, too!